Mind you, we need the rain. But I’m not sure we need a whole year’s worth in the space of a few weeks. That’s Texas, though… seems like just yesterday I was worrying about the drought and wondering if we’d continue to have water every time we turned the tap on. OK, maybe not literally, but near enough. The ground is completely saturated, lakes and rivers are overfull, and still it rains. And, odd as it may seem (and it certainly seems odd to me even though I understand it) we have more severe water restrictions in place now than we did during the drought! The city purification system just simply can’t handle how filthy (silt, sediment, and debris) the water is that’s tumbling downstream to here from the lakes. The system is choking. We’ve been told by the city of Austin that until further notice we’re to boil all tap water for drinking or otherwise ingesting for at least 3 minutes, then cool. Also any water used for washing dishes. They do tell us it is still safe to shower, just don’t brush your teeth or really open your mouth at all while you’re in there! That’s why I’m trying to come up with things that don’t require lots of fixing. Bananas are good. No washing required, just peel and eat. Other fruits can use more utensils or handwashing (oranges and melons come to mind) or at least require washing (grapes). Put eggs in a pan. Cover by an inch or so with tap water. Bring to a rolling boil. Reduce heat to a more gentle boil. Boil for 6 minutes. Turn off heat and let eggs rest for another 4 minutes. 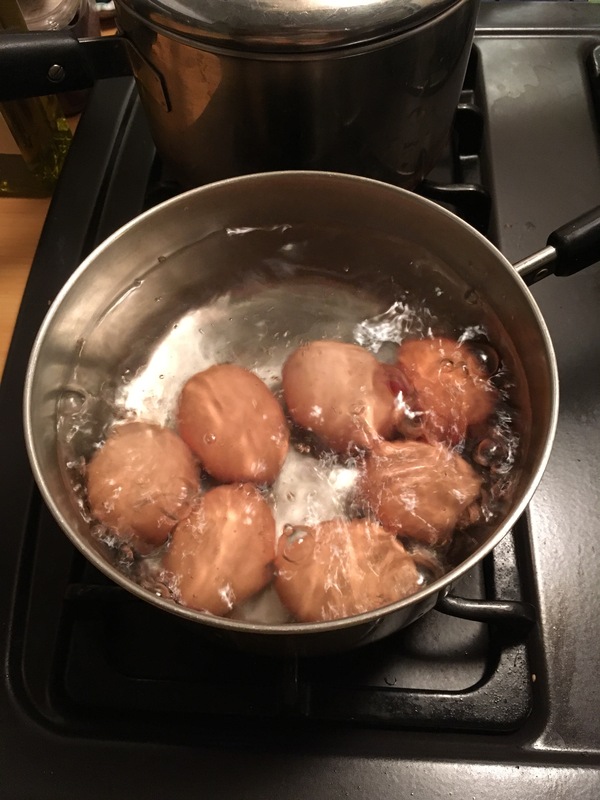 Remove eggs from still very hot water using a slotted spoon. Let eggs cool a bit before putting them in the fridge. Use the still hot and now “purified” water to rinse any utensils or dishes. So far the city hasn’t given any firm indication of when the water issues will be resolved. Theoretically we are to have a dry sunny beautiful weekend and no rain is forecast until next week sometime. We’ll see. Meantime I have plenty of seemingly safe water in the fridge and I’m keeping my fingers crossed. Until next time, enjoy your ready-to-drink tap water and stay safe! Goodness, I don’t recall ever having to boil water as long as I lived in Austin. Hope it clears up soon. Sorry about your troubles. We’ve already seen snow, and that’s a big trouble to me, but brings with it no health complications. Unless you fall and break your neck. Simple veggies and fruit will get you through this. When it rains it pours and Texas certainly has had more than its share of weather problems. Hope you are back to normal soon. Thanks! Honestly, I’m not complaining. At least we had water even if we had to boil it. This could have been much worse!! And we hope to be back in business perhaps as soon as tomorrow. Great attitude…hope it is soon.